I'm having a problem with vegetables growing near a black walnut tree and was wondering if it was something the tree was shedding or is it the roots taking the moisture out of the earth that is causing them to be slow to grow? 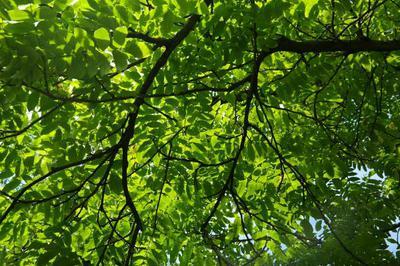 Black walnut trees, or Juglans nigra emit their very own herbicide, known as juglone. It's contained in all parts of the tree; the roots, leaves, bark and the nuts. It leaches off the leaves in the rain. Nothing grows beneath them, and the leaves have the same effect if they're composted. Move your vegetable garden away from the tree, if you ever want any fruit or vegetables. As far as I know, this is pretty well permanent, even if you cut the tree down. It will take years of rain to leach the chemical away from the soil.